Chrome tubes, with 8 towel rail ends, bought from B&Q. 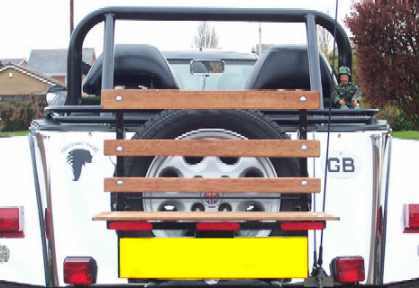 Cut the tubes to length, and mount them on your boot lid. 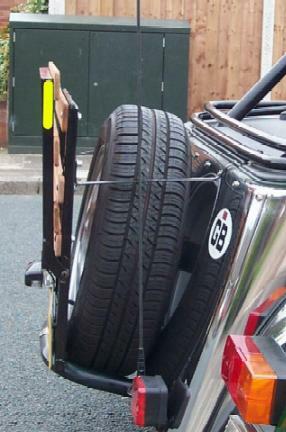 I've made a spare wheel bracket that is strong enough to have a rack clipped over it to carry camping equipment, although the inside of the boot MUST be strengthened up and braced to carry the weight. 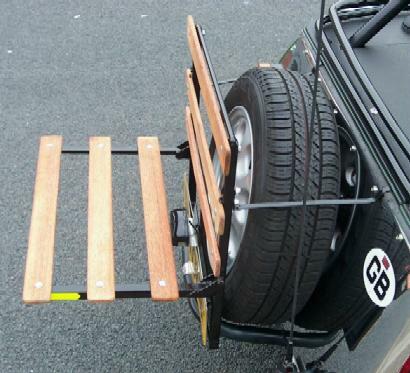 The rack is just put over the tyre and a tie down strap put around the whole wheel to secure it. This boot rack is best for the monocoque chassis. 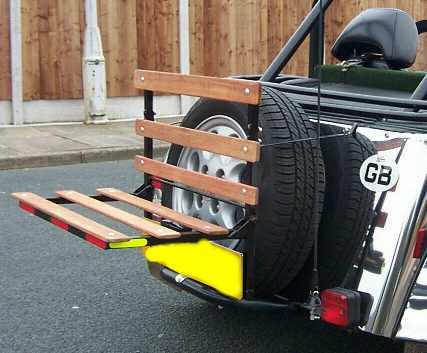 This is an alternative boot rack for a 2B chassis, made by Dave Tomlinson, the rack is made up of square section tubing that he's 'found' with two lengths of larger square tube fastened to the bottom of the spare wheel hoop, these will allow the legs of the rack to slid into them, and the whole lot is kept in place by a ½" dia pin that goes through both pieces on each leg. as you can see from the first photo, Dave has bolted the 'mounting' tubes to the 'loop' but they could be welded on, taking care about petrol fumes. He has tested it out, and says that it will take his weight on it no problem! 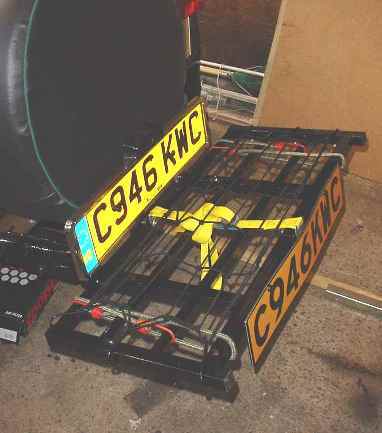 Note, you must have your numberplate on view even if the rack is loaded up. This is a "prototype" rack for the 2B made by Tony Tank. 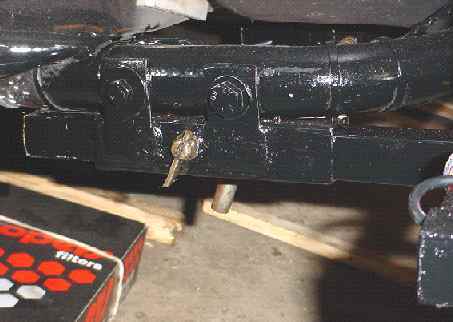 2 bolts fasten through the spare wheel loop, the 2 small stays are bent to allow fitment of the weather gear and are fixed by a self-tapper in each, inside the boot space. So within a few minutes the whole rack can be removed. As you can see, it is made to fold up when not in use, and still be left in place, when on those weekend camping trips. It also doesn't get in the way of the number plate. This a a very strong, yet reasonably lightweight rack, in fact Tony has tested it by sitting on it.